> Dried Mushrooms>Maitake>Dried Maitake - 2 oz. Maitake are indigenous to North America, Japan and China. Traditionally called 'butterflies dancing', 'dancing mushroom', or 'Hen of the woods'. Today wild maitake are a rare find. Maitake mushrooms can promote weight loss and decrease obesity when combined with light exercise. Maitake are indigenous to Japan, China and parts of North America. Traditionally called 'butterflies dancing', or 'dancing mushroom'. In North America maitake are called 'hen of the woods', the rippled clusters reminiscent of ruffled feathers. 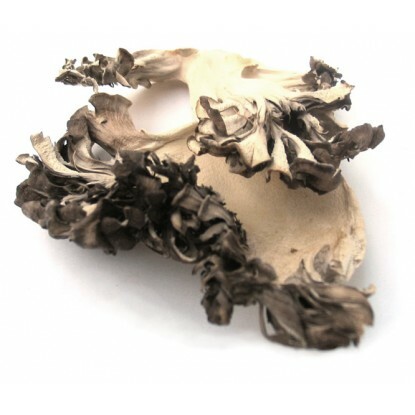 Most recently maitake are called the 'King of Mushrooms' for its many health promoting qualities. Maitake may be the most versatile mushroom of all. It has a unique, truly excellent flavor that neither overpowers nor is easily overpowered. I think it has a slightly astringent edge. It is great sautéed, deep-fried, microwaved, boiled, and dried. I love this one! It has a really pleasant, crunchy, very chewable texture all the way down the stem. A moderately thick batter is best for deep frying maitake. To rehydrate or reconstitute dried mushrooms, place desired amount into a bowl covered with warm water and let dried mushrooms soak for 30 minutes. After the 30 minutes have gone by, gently lift the mushrooms out of the water using a strainer. The mushrooms should be clean, plumped and ready to use.